July 14, 2012 — Ethiopian despot Meles Zenawi failed to attend the New Partnership for Africa's Development (NEPAD) meeting and the opening of the AU Summit in Addis Ababa, due to his deteriorating health problems, according to the President of Senegal. In place of Meles, who is the current chairperson of NEPAD, Macky Sall, the newly-elected President of Senegal, opened the event and briefly informed members of Meles' poor health as the cause of his absence. 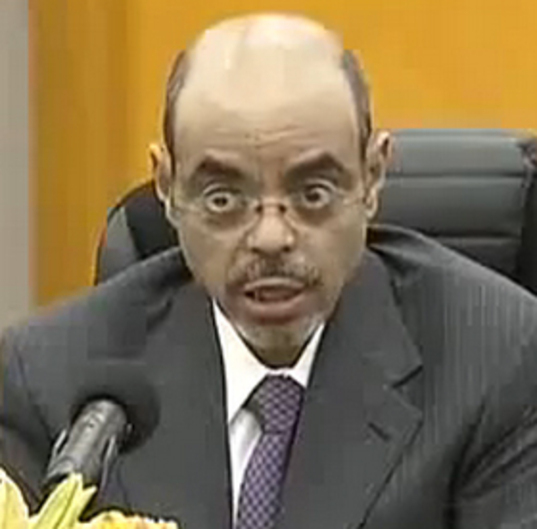 "PM Meles is not attending this meeting with us this afternoon for health reason. We would like to express that we wish him to recover soon to a better health," President Sall notified attendees. Since attending the G20 Summit in Los Cabos, Mexico last month, Meles has not been publicly seen. During his absence, he has missed key events, including parliamentary sessions, TPLF martyrs' day ceremony, NEPAD meeting and the today's opening of the AU Summit. Based on Meles' notorious tobacco and alcohol consumption, and on his recent thin and frail appearances, a doctor from Addis Ababa explained Meles' aliments are serious and could be potentially life threatening. "I think Meles' weight loss and gaunt appearance, coupled with his excessive tobacco and alcohol consumption, all indicates to me he is suffering from something very serious and could potentially be life threatening," the Dr. said by phone, who spoke on condition of anonymity.